Activewear is like a ferociously fit woman in her favorite Soul Cycle class: Cannot. Be. Stopped. What we like is how stylish these clothes are, along with being supremely comfortable. Perfect for modern women who are out of the office most of the time--if they even have a traditional office these days. We're all on the move, and we like to look good while in motion. These sporty yet polished pieces, what we call Sleek Athletic, are fitted (all those classes do pay off!) and flattering, with clean lines, vivid colors and interesting touches. Stylish track pants and bomber jackets are showing up everywhere in particular this season, with other pieces catching our eye too. Tory Burch Slightly equestrian but not too exaggerated, this is polished weekend dressing at its best! Slim white pants stand in striking contrast to a scarlet zip-front top and trim color-blocked jacket. Tasseled booties and a small, structured shoulder bag complete the look. Lacoste Here comes another "track star." The tricolor jersey takes a feminine turn with a peplum hem. Pairing it with matching pants creates one long, slimming line. Note the addition of white shoes, once again! Louis Vuitton This dress reminds me of a jockey's "racing silks." Its fluid silhouette is as easy as a T-shirt. The red/black/white mix provides instant impact. Cédric Charlier If you don't know of this designer, please make it your business to. Cedric consistently delivers sleek, modern clothes with real women in mind. Love this track pant and turtleneck combo. The white shoe picks up on the top's white bodice, pulling it all together. Prada Miuccia Prada's Fall collection presented a wild mash-up of ideas, ranging from utilitarian to sporty to militaristic to mystical. The oversize quilted jacket and velvet "tackle bag" evoke a fisherman's gear. When shopping for Sleek Athletic, you'll see how wildly versatile these pieces are. Transition to Fall Wear an Opening Ceremony Skirt or a Rag & Bone dress now during the hottest weeks of the year. Throw on a blazer or cardigan, match with a turtleneck, when the temps cool--they'll still look fabulous! Dress Up Athletic-Inspired Pieces Treat a bomber jacket like a blazer, with skinny jeans and heels, it's a perfect look for cocktails. We love the ones from Misguided and Rag & Bone. 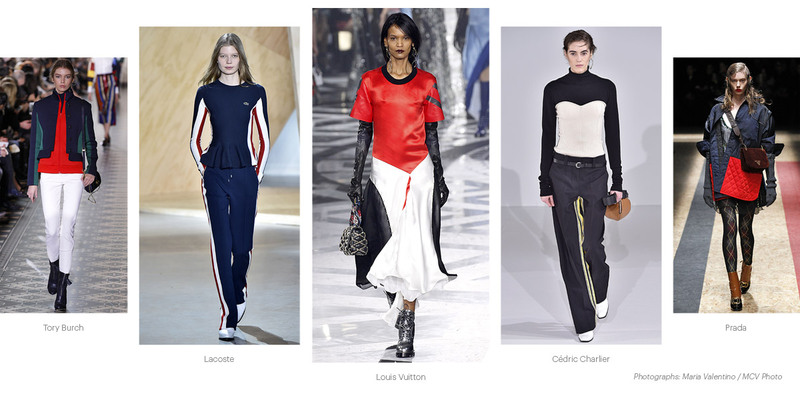 Glory in the sporty details Check out the studs in the Monrow sweats, the stripe down the side of a Tory Burch pant, the vertical racing stripe on a Stella McCartney shirt!